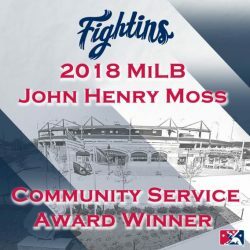 Minor League Baseball has announced the Reading Fightin Phils have received the 2018 John Henry Moss Community Service Award. They are the sixth-ever recipient of the award. The award was introduced in 2013 by Minor League Baseball in honor of John Henry Moss, who founded the South Atlantic League in 1959 and headed the circuit until 2007. The award is given to a club that demonstrates an outstanding, on-going commitment to charitable service, support and leadership. The award will be presented at the Baseball Winter Meetings Banquet on Dec. 9 at the Mandalay Bay Resort and Casino in Las Vegas, Nevada. In addition to the award, Minor League Baseball Charities will make a $2,500 donation on behalf of the Fightin Phils to Baseballtown Charities. This past April, the Fightin Phils unveiled the brand new Savage 61 Dream Field, which is a facility that provides children with physical and developmental disabilities the opportunity to play baseball. The unique rubberized surface is the first field of its kind to be built in Berks County. The project is fully funded by Baseballtown Charities, the Reading Fightin Phils charitable organization. 110 children with physical and developmental challenges played in the inaugural spring league, plus another 60 children played in the fall league. More than 850 volunteers have devoted their time in working with these children. The Dream League Field is the second one million dollar stadium built by Baseballtown Charities. The first, Gordon Hoodak Stadium at Lauer’s Park, built in 2006 has provided more than 1,000 children from Reading the opportunity to learn baseball, softball and life lessons through the game. The momentum of Gordon Hoodak Stadium, the Baseballtown Dream League, and now the John Henry Moss Award, Baseballtown Charities is even more energized and ready to tackle their next challenge: Baseballtown Charities Rip It for Life. Rip It for Life is a program that will identify young baseball and softball players who want to get better as players, but who face socio-economic challenges. Players identified to participate in the newly formed Baseballtown Charities Rip It for Life program will receive incredible baseball and softball training at no cost to them. The goal of Rip It for Life is to make the kids the best they can be, both as players, and as people, one kid at a time.